Michael Gary Foltynewicz was born October 7, 1991. Foltynewicz grew up in Illinois and wanted to be a major league player from an early age. He grew up a St. Louis Cardinals fan. He says that his parents, Gary and Cindy Foltynewicz, both developed elbow problems one summer due to throwing him so much batting practice. He graduated in 2010 from Minooka High School in Minooka, Illinois. He was drafted by the Houston Astros in the first round of the 2010 Major League Baseball Draft. He played in the minor leagues until he was called up to the Astros in August 2014. The Astros traded Mike Foltynewicz, Andrew Thurman, and Rio Ruiz to the Atlanta Braves in exchange for Evan Gattis and James Hoyt on January 14, 2015. During the 2017 season, Foltynewicz began holding Folty’s Fridays, a community outreach initiative meant to engage children. He is married to Brittany Wortmann. The couple’s first child, a son, was born in February 2018. He was invited to spring training and sent down to the Triple–A Gwinnett Braves on April 4. Through his first four starts with Gwinnett, Foltynewicz posted a 2.08 ERA over 21.2 innings with 30 strikeouts and 10 walks. On April 30, third baseman Chris Johnson was moved to the 15-day disabled list, allowing room for the Braves to call up Foltynewicz to replace struggling Trevor Cahill in the starting rotation. Foltynewicz made his Braves debut on May 1 against the Cincinnati Reds, earning his first career win over five innings pitched, allowing two earned runs. On the same night, Foltynewicz also recorded his first career hit, a double that scored two runs. Foltynewicz was optioned to Triple-A Gwinnett on June 17 after seeing his ERA rise to 5.19 in his previous three starts. He was recalled on July 7, after utility player Joey Terdoslavich was optioned to Gwinnett. He served as an extra reliever in Atlanta’s bullpen during the final games before the All Star break. On July 12, after the final game of the first half, he was optioned back to Gwinnett. Foltynewicz was recalled on July 30 to make a spot start for Manny Banuelos. He began to fall ill on August 18, and was first diagnosed with costochondritis in September, which soon developed into pneumonia. On September 19, Foltynewicz suffered a further setback, and was diagnosed with blood clots in his pitching arm. Two days later, Foltynewicz underwent a rib resection to remove the anterior half of his first rib to deal with the clots. As a result of the surgery, he lost approximately 20 pounds (9.1 kg). In 2015 for Atlanta he was 4-6 with an ERA of 5.71. Foltynewicz contended for a rotation spot in spring training in 2016. The Braves eventually assigned him to Gwinnett at the end of March to give him more time to recover from surgery.Foltynewicz was recalled on May 1 to replace Bud Norris in the rotation. Foltynewicz made his season debut the next day, taking a loss against the New York Mets. He returned to the disabled list on June 4 with a bone spur in his elbow. Foltynewicz was reactivated on June 29, as the Braves’ rotation was beset by injuries to other pitchers. On June 30, 2017 against the Oakland Athletics, Foltynewicz took a no hitter into the ninth inning; however, he allowed a home run to the leadoff man and was pulled after the home run. He finished having allowed one run on one hit with four walks and eight strikeouts over eight plus innings. In 2017 for Atlanta he was 10-13 with an ERA of 4.79. 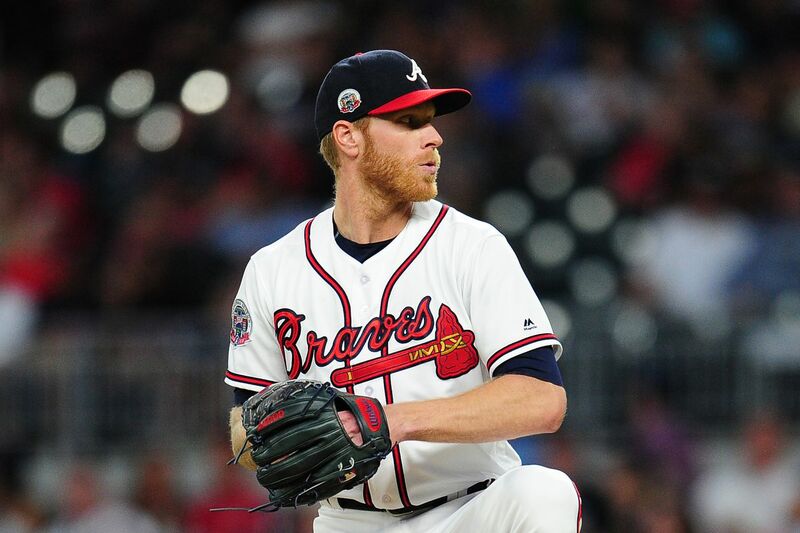 Foltynewicz was eligible for arbitration prior to the start of the 2018 season. He was awarded a $2.2 million salary. During spring training, Foltynewicz pitched primarily from a modified set position, to help mitigate struggles he had faced in previous seasons. On June 1, 2018, Foltynewicz pitched his first career complete game against the Washington Nationals. He didn’t allowed a run on two hits with a walk and 11 strikeouts. He was named to the 2018 MLB All-Star Game after owning a 6-5 record and a 2.37 ERA over his first 17 starts of the season. But the pitcher with perhaps the most upside of them all is Mike Foltynewicz, who’s been there and done that, yet has taken another step in 2018 that none of the Braves’ prized prospects are guaranteed to make.